Color loose orchids are naturally infused with bright dyes. The color is within the loose orchid blossoms, not ‘sprayed on’ or applied from outside. We have four colors to choose from as shown. One week advance order is required! We need your order at least week prior to shipping. This is so we can make sure your chosen color and amount are available. These dendrobium loose orchid blooms are imported from Asia and treated to a special coloring process. This gives them their brilliant hues. The orchid begins on the stem and is a purple with white center. 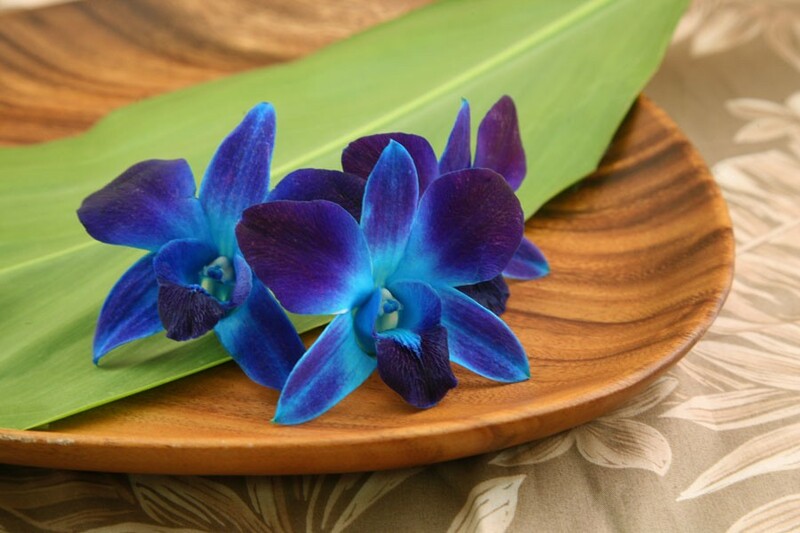 The orchids naturally draw the color through the stem and into the bloom. The colors are shown and the prices are per one hundred blooms. There are a myriad of uses for color loose orchids. Match the color with your wedding theme color. Then use them to decorate at the wedding or reception. 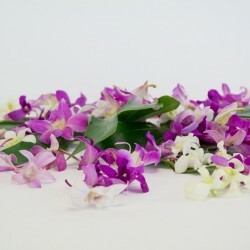 In May and June we sell lots of loose orchid blooms for making graduation leis that match school colors. These blooms will brighten up tables, trays, walkways and plates at any Hawaiian luau or other occasion. 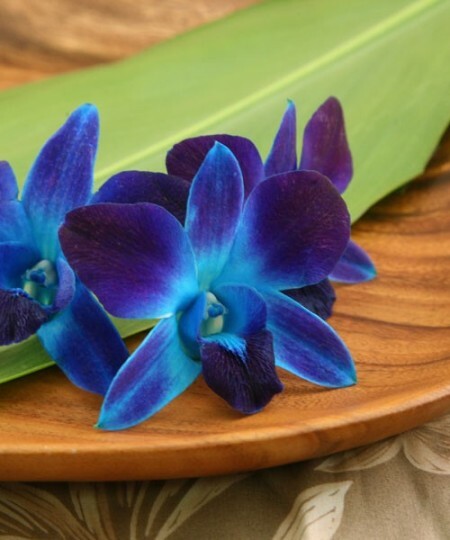 Choose from blue, green, red or yellow orchids. If you prefer loose orchids with natural color we have them as well. They are easy to care for. Just open your FedEx box right away. Mist the blooms lightly with clean water. Keep the loose orchids in a refrigerator until you are ready to decorate.